I have ATMEGA328 (running on 5V) connected to a C4793 NPN transistor which controls the TEC1-12706 thermal component. Everything is working great, except that the thermal module only gets 0.6A of current, even though the datasheet of the C4793 transistor states that it can handle 1A of current. If I connect the base of the transistor directly to the VCC, I get 1.07A to the thermal module, which is exactly what I need. I can't understand why I only get 0.6A when doing the same thing from the ATMEGA328. I thought maybe it's because ATMEGA328 puts out only 20mA from the PIN, but isn't the transistor triggered by the voltage instead of current? Any suggestions please? Thanks! You are using a NPN transistor for high side switching. This means the bjt will never turn on fully. Voltage at base needs to be about 0.7 V more than voltage at emitter for NPN to turn on fully. Additionally, I do not recommend running the uC pin at full current it is capable of. So minimum resistor should be (5.0-0.7)/0.02 = 220 ohms. But 330 ohms is better. Typically, 1K is used. Which means, for an optimal design, you need a transistor with higher gain. You can do this yourself by putting 2 transistors in a darlington configuration. You can replace the transistors with a single logic level mosfet. A cheap and (somewhat) commonly available one that will work here is AO3400. 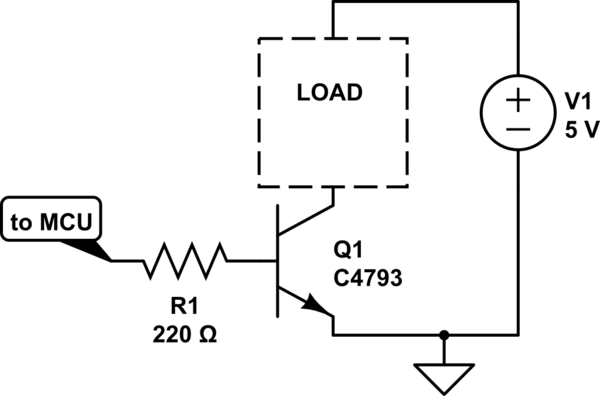 NOTE that your load no more has a common ground with the rest of your circuit. If this is a problem, you will have to use high side switching. However, this will require PNP BJT or P-channel mosfets. It will also invert the switch on/off logic. If the load operates at more than 5V, it will also mean an additional NPN switch for the PNP switch. Alternately, in the first schematic, 2SC4793 can be replaced with the TIP122, which is a complete darlington pair transistor in a TO220 package... quite cheap and common, has great characteristics, and finds many uses in the lab and for projects. 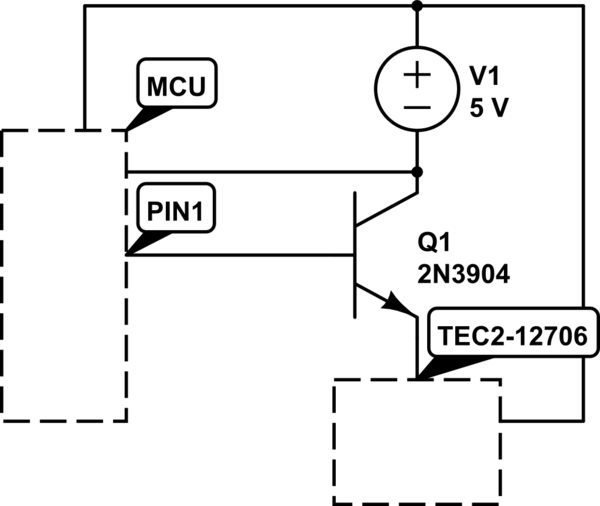 Connecting the transistor as a high-side switch, as you did in your original schematic, is actually valid, provided you consider the implications. You have been told about the 0.7V drop from base to emitter, so your load will see a voltage that is 0.7V less than the voltage at the output pin of the microcontroller. If that's OK, you can use this kind of circuit. Another consideration is the current gain of the transistor at this operating point. You can consult its data sheet to find this out. 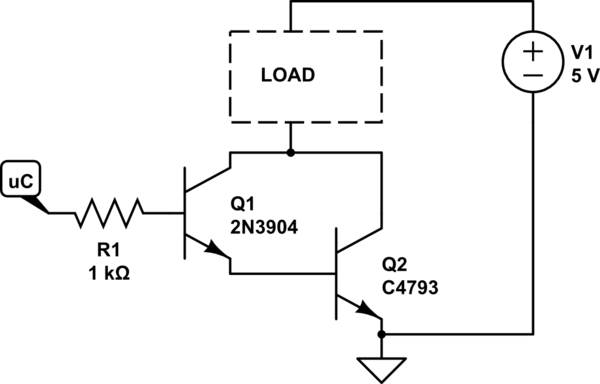 In case of the C4793 (actually 2SC4793), you will find that at very low collector-to-emitter voltages the current gain drops significantly. This means that the transistor needs correspondingly more base current, which has to come from the output pin of the controller. This typically makes its output voltage drop, hence the voltage at the emitter will also drop. See the controller data sheet for valid current values. This may well have been a significant effect in your case. If you want to use a single transistor, you need to select one that has sufficient current gain at the operating point you are interested in. If you can't get enough current gain from one transistor, you need to come up with a different circuit, for example one that uses two transistors. You have been shown how. Not the answer you're looking for? Browse other questions tagged microcontroller transistors or ask your own question. How to remove leakage current from nRES transistor switch? Transistor current limiter, microcontroller controlled? RF current output from microcontroller? Why my transistor switched when base was grounded? What is a weak transistor? Microcontroller GPIO status when switched off ? Can current flow from internally in microcontroller from one gpio to other gpios when switched off?